Our 'Passport To The Best Day Ever' promotions is back with RM150 (6 months) and RM200 (12 months) UNLIMITED ENTRIES to 6 Parks! Meet out #QuackieCruisers team at Giant, Kelana Jaya this weekend. 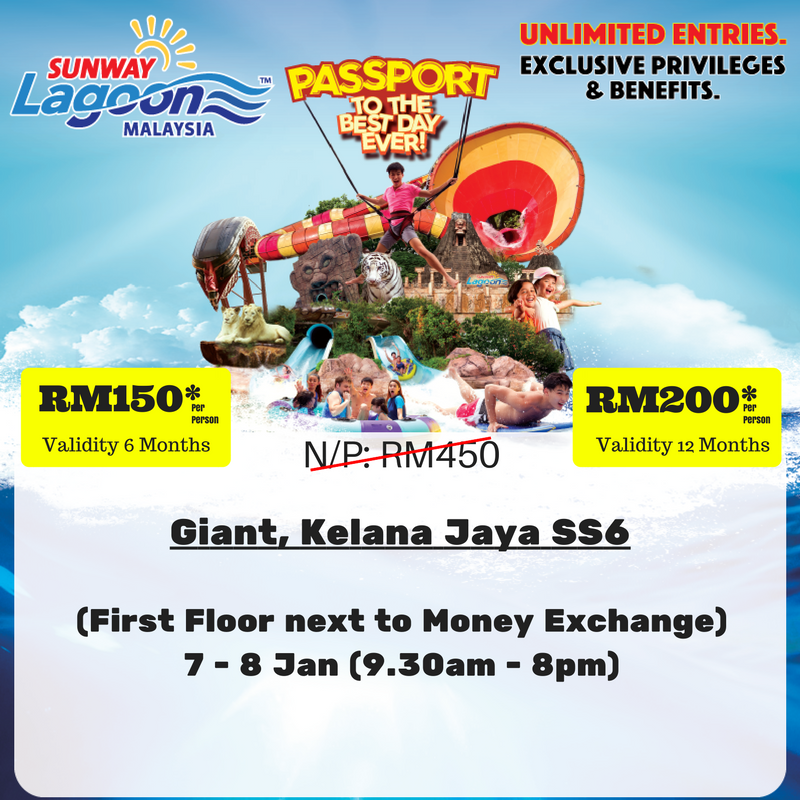 Proudly Present ALL NEW Customer Loyalty Program — SUNWAY LAGOON PASSPORT. Unlimited Entries*. Now With Exciting New Rewards & Benefits Awaits You! You Can Now Enjoy 6 Parks For Only RM450/Per Person RM200 For A Year. 10% Discount on Dining: Applicable at participating outlets only. Passport holders are entitled to unlimited entries (single entry per day) to Sunway Lagoon – pass MUST be presented in person at ticketing counter in order to gain admission into Sunway Lagoon. RM50.00 penalty fee will be imposed if failure to comply. Passport holders MUST present original NRIC/MyKid/I-Card/Multiple Entry Visa for verification purposes during entry. Sunway Lagoon Passport is non- transferable and non-refundable in any part or whole. It can only be used by the signatory. Sunway Lagoon Passport is not applicable for travel agent and tour services. Kindly send us the completed Passport registration form (s), a passport sized photograph(s) and your E-ticket after payment to [email protected] to complete the registration process. Registration process will take approximately SEVEN (7) working days from the date of email received on the details. E.g. If the transaction date is on 1st August 2016, thus Passport will be ready for collection from 10th August 2016. Kindly print and present the confirmation email at the Passport counter located at Sunway Lagoon Main Entrance for redemption. Redemption period: Daily from 10am to 6pm. e.g. : If the transaction date is on 1st August 2016, thus Passport will be ready for collection from 10th August 2016. Authorization letter and a photocopy of Identification Card/passport are to be presented at the Sunway Lagoon Passport counter if collection of passport is done on behalf. Sunway Lagoon has the right to check and disallow the redemption of the Passport if the card is redeemed by a different person. Sunway Lagoon Passport will be considered void of terms and conditions are breached. General terms and conditions on admission to Sunway Lagoon applies.